Study shows why people with the ApoE4 gene are more susceptible to Alzheimer’s disease. For decades, scientists have known that people with two copies of a gene called apolipoprotein E4, or ApoE4, are much more likely to have Alzheimer’s disease at age 65 than the rest of the population. Late-onset Alzheimer’s disease, the subset of the disorder occurring in people age 65 and over, affects more than 5 million Americans, and is characterized by progressive memory loss and dementia. Past studies have suggested that ApoE4 may affect how the brain clears out beta-amyloid, however, what is happening at the molecular level isn’t clear. Now, a study from researchers at the Salk Institute identifies a connection between ApoE4 and protein build-up associated with Alzheimer’s that provides a possible biochemical explanation for how extra ApoE4 causes the disease. The team state that their findings underscore the importance of looking at genes and proteins not classically associated with Alzheimer’s to make progress in understanding the disease. The study is published in the Journal of the American Chemical Society. Previous studies show that Apolipoprotein E comes in three versions, called ApoE2, ApoE3 and ApoE4. All the ApoE proteins have the same normal function, carrying fats, cholesterol and vitamins throughout the body, including into the brain. While ApoE2 is protective and ApoE3 appears to have no effect, a mutation in ApoE4 is a well-established genetic risk factor for late-onset Alzheimer’s disease. 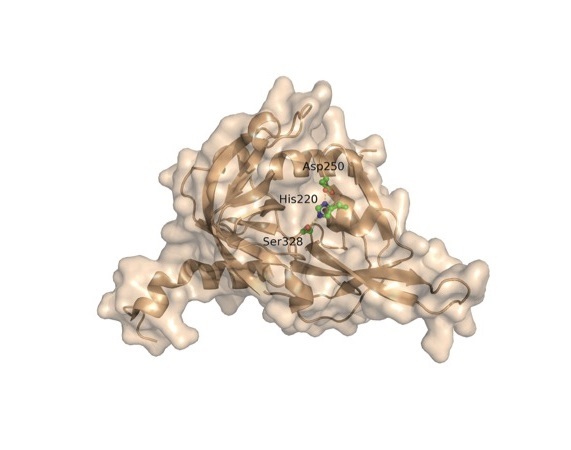 Scientists had previously uncovered hints that ApoE4 might degrade differently than the other variants, however, the protein that carried out this breakdown of ApoE4 was unknown. The current study investigates one enzyme called high-temperature requirement serine peptidase A1 (HtrA1), which is found in the nervous system, to find the protein responsible for degrading ApoE4. The current study investigates how HtrA1 degrades to show that the enzyme processes more ApoE4 than ApoE3, chewing ApoE4 into smaller, less stable fragments. The lab confirmed their observations in both isolated proteins and human cells. The group state that their results suggest people with ApoE4 could have less ApoE overall in their brain cells, and more of the breakdown products of the protein. The team explain the general theory is that ApoE4 breakdown products could be toxic, and knowing the enzyme which breaks it down they now have a way to actually test this idea. They go on to add that it’s not just a lack of full-length ApoE or an increase in its fragments that may be causing Alzheimer’s in people with ApoE4. Data findings also show that ApoE4, because it binds so well to HtrA1, keeps the enzyme from breaking down the tau protein, responsible for tau tangles associated with Alzheimer’s. The team surmise that the global medical community have thought about tau or amyloid beta as things that cause Alzheimer’s, however, their observations suggest more sway needs to be given to proteins that could be impacting tau or amyloid through biochemical pathways. For the future, the researchers state that their results need to be confirmed in animal studies before they can verify the link between HtrA1, ApoE4 and Alzheimer’s in humans. They conclude that if their results are validated, they could point toward a better understanding of the disease and potential new treatment strategies. Salk scientists identify that the enzyme HtrA1 (pictured) degrades ApoE4, the strongest genetic risk factor for Alzheimer’s disease, providing new information that might eventually lead to new treatments for the neurodegenerative disorder. Credit: Salk Institute.